We also understand that you may not know us very well and would like to read some reviews made by other knitters, so here are a few from Instagram! "meanwhile, I'm just chilling here, learning how to knit a jumper! #woolfulxbichesKAL"
"Snow outside and dark but how wonderful is this? @bichesetbuches #bichestbuchesshawlno30 #woolfulxbicheskal"
"Swatched, casted on, and markers placed. No. 14. #woolfulxbicheskal"
"Discovered these two gems make the perfect pair 😊"
"My scrappy little swatch, but a swatch nonetheless! So excited to be casting on for the year long #woolfulxbichesKAL // I'm knitting the no. 3 sweater...visit bichesetbuches.com to pick up your kit or yarn and join along! And if you haven't already, listen to episode 67 to hear sweet Astrid and Caroline and their fiber journey 👉🏼 woolful.com"
"This pattern, this yarn, the smell of salty moors and windy dunes... I'm hooked." 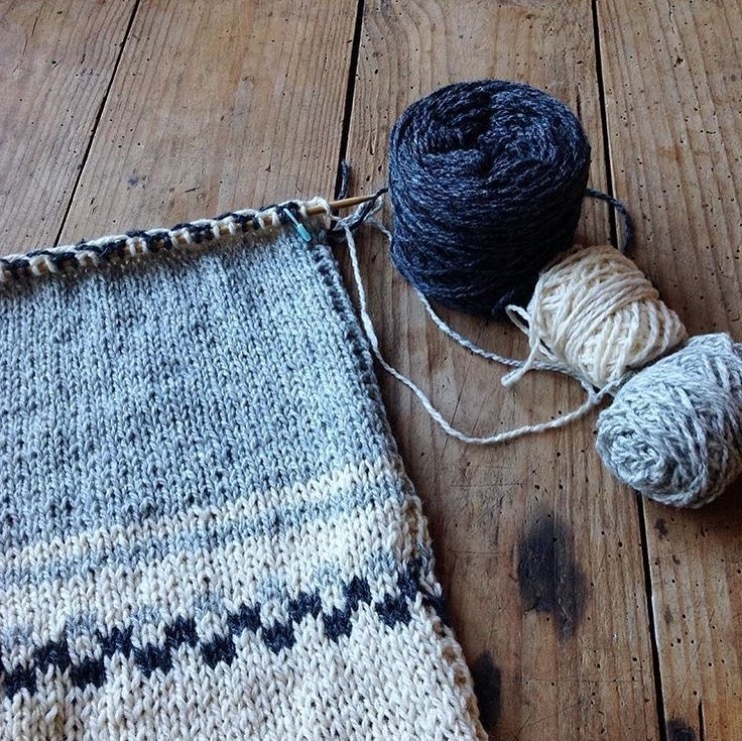 "#woolfulxbichesKAL My B&B sweater #21 has started! I am happy with the colorway I chose and the first sleeve (which served as my swatch) is almost done already!" "Biches et bûches no 51 approuvée pour les brouillards d'hiver @bichesetbuches 👍😊"
"Finished my #woolfulxbichesKAL mittens just in time for Christmas ❤️ Neat pattern and perfect yarn - i think I'm hooked to this wooly goodness. Thanks to @woolful for introducing me to this little business, it's one I hope to support further, especially seeing as it's relatively close to home. Looking forward to seeing what patterns other people use for this KAL and I'm sure will be inspired for my next project!" "Beautiful knitted color combinations with the @bichesetbuches sweater no. 5. ❄"
"It's my future sweater! This kit is for knitting the no. 25 from Biches & Bûches. The yarn looks so amazing! 🎄"
"How beautiful my #bichesetbuches sweater is growing! Still working on the sleeves..."
"Joining @woolful and @bichesetbuches for the #woolfulxbichesKAL. I ordered this shawl kit after hearing Ashley's podcast featuring Biches & Bûches... and before knowing about the kal. Perfect timing I think! Must finish a test knit and some gifts before I begin." "Enjoying morning knitting with my lovely @bichesetbuches sweater no. 5, before a busy day full of school felt crafting and another big Nutcracker performance tonight. My little one will be an angel. ❄"
"Thumbing. Getting excited to finish my first mitt 😊 always love seeing your stitches take form"
"Sweater is done 🙌 ... so happy with the result! Pattern and yarn from the very talented @bichesetbuches! It's going to be a very creative week! Happy day friends 🎄!" "One (thumbless) mitten down, one to go. After I got past the 1x1 color work stage, things sped up quite dramatically 😊 I also really like using three needle bind off for mittens, never used it before but it's nice and tidy"
"Making progress on the #bichesetbuches KAL"
Loving these colours together, but the 1x1 colourwork took me a LONG time holding both strands in one hand 😂"
"There's something about @bichesetbuches that moves me deeply, in a way few others do. It's hard to explain...their design aesthetic and the simple rusticity has shifted me from a place of creative desertification to an overwhelming creative desire. This is a very good thing. If you haven't already listened to the latest #woolfulpodcast episode where Astrid and Caroline tell their story, please do. And make sure to visit Woolful.com for photos and to enter the giveaway for this beautiful mitten kit of theirs. Focus on what inspires you and chase after what comes from it. 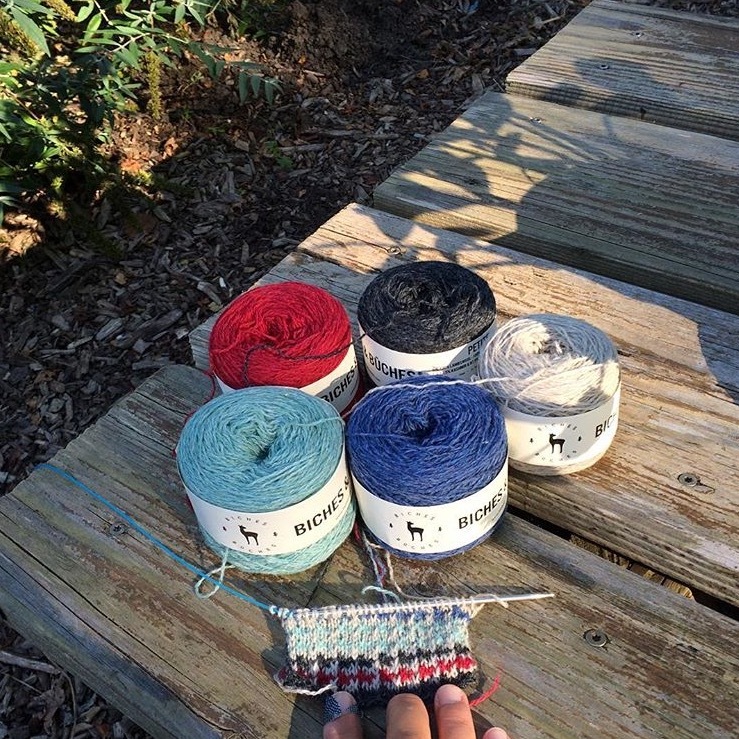 🍂🐏👌🏼"
"OUTDOOR SWATCHING for a @bichesetbuches sweater for my husband. My daughter calls this deer yarn."